The Society for Social Studies of Science (4S) conference this August was not just a site of interdisciplinary and cross-cultural scholarly exchange, or a good excuse to plan a trip to Japan. It offered, in the almost endearingly undertheorized words of the Society’s online Annual Meeting announcement, no less than “a chance to experience, interact with, and understand the cultural diversity of Asia.” Hardly ones to pass that up, a few colleagues and I packed our bags and set off to interact with the world’s largest continent. The annual meeting was held in a cluster of slightly forsaken numbered buildings on the Komaba campus of the prestigious University of Tokyo. Just a couple of stops off of Tokyo’s main circular railway line, via a small train with plush pastel seats and Hello Kitty-adorned windows, the Komaba campus serves as the University’s center for first- and second-year undergraduate general education. Upon arrival at the main gate, we were directed through a ginkgo path to a registration area that, while lacking in some basic amenities such as water, did provide conference-themed sandalwood fans that proved indispensable in Tokyo’s summer heat. The conference was a 4-day event organized around the theme of “STS in Global Contexts.” Held as a joint meeting with JSSTS (Japanese Society for Science and Technology Studies), it offered a unique opportunity not only to engage Science Studies questions by situating them within broader transnational networks, but also to consider the particular significance of STS as a burgeoning field in contemporary Japan, and thus to reflect upon what a distinctly East Asian STS might look like. 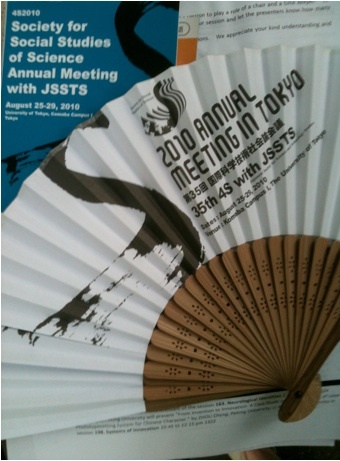 Indeed, in a message printed in the conference program, JSSTS president Hideto Nakajima noted that locating the meeting in Tokyo served as a meaningful index of the “not only economic but also socio-political importance” of STS to East Asia – a region which, Nakajima claimed, only in the “last decades…starts its steady economic growth,” more than sixty years after the end of World War II. Many of the panels throughout the conference days echoed a sentiment of excitement over new possibilities for collaborative international scholarship, and the final day of the program was dedicated to Japanese language presentations. The over 200 sessions, while difficult to characterize under any small set of unifying themes, could be described collectively as bringing some of the field’s most compelling and oft-revisited issues into dialogue with new objects of inquiry. (Flipping quickly though the conference program, for example, I caught sight of “Religion,” “Bioethics,” “Online Governance,” “Intermediaries,” “Sense Making,” “Responsible Innovation,” “Blindness” and “Reflexive Modernization” “In Action.”) Unsurprisingly, many of the talks tapped directly into classic STS questions concerning knowledge production and circulation, forms of expertise, translation and boundary work, and the social and political dimensions of (bio)technological innovations. These topics, when brought to bear on such actors as Nintendogs™, nanoparticles, and laboratory animals, allowed some presenters to reflect in new and productive ways on how science and technology come to not only mediate human experience, but also contest and redefine its very meaning. I will focus the remainder of this report on some of the pivotal points that were discussed in two notable panels that I attended. This well attended panel, organized by University of Tokyo Sociologist Miwao Matsumoto, sought to make a specific intervention into a number of arguments that have stemmed from Harry Collins’ and Robert Evans’ (2002) proposed “Third Wave of Science Studies.” Rather than summing up debates over whether, as Collins and Evans have suggested, we need to construct new boundaries and categories of scientific knowledge that can distinguish between the contributions of a technically qualified elite and the broader public, the session’s stated goal was to consider the problem of knowledge distribution as not only contained “[with]in the sphere of knowledge,” but also as implicated in “various modes of ‘real politics’ such as technocratic or participatory.” To that end, Collins, Brian Wynne (whose study of Cumbrian sheep farmers (1996) was invoked by Collins and Evans  to illustrate the difference between ‘interactional’ and ‘contributory expertise’), and Steven Epstein were invited by Matsumoto to reflect on STS’s relationship to science policy. Collins’ presentation focused primarily on outlining what he termed “the current state of play in work inspired by the Third Wave idea.” This description of the technical and methodological developments of the program was to be followed by a consideration of the Third Wave’s political approach, but due to time constraints the latter subject was only addressed during the question and answer period. The remainder of Collins’ presentation focused on a description of “the imitation game” as an emergent Third Wave methodology that, he argued, “touches on things like ethnography and anthropology – you can use the imitation game to think about where you are, as an ethnographer or an anthropologist would do with fieldwork.” Through an examination of such exercises as “gays and lesbians pretending to be straight and vice versa; active Christians pretending to be atheists,” Collins claimed that the Third Wave is forging new scientific pathways relevant to philosophy, management, media studies, and criminology. Epstein concluded by suggesting three directions for future work on science and politics: (1) The “greater empirical study of the connections between the normative orientations that concerned groups take towards science, and the kinds of contributions and interventions that they make”; (2) An examination of the co-production in real time of new collective identities and models of representative democracy, or “what happens when science makes the groups which are then called upon to contribute as a group to…decision making around those sciences?”; (3) An increased study of lay expertise in response to “undone science,” including that which isn’t studied, isn’t known, or cannot be discussed. The two compelling papers that comprised this panel each spoke to the ways in which current, provisional molecular knowledge and imagined or promissory futures interact to produce enduring forms of subjectivity. Karen-Sue Taussig’s talk, titled “On Democracy: Citizenship and the Obligation to Participate in Scientific Research,” examined two university-affiliated projects ostensibly designed to facilitate public participation in forward-looking genomic research. Taussig’s primary ethnographic case is a University of Minnesota three-year longitudinal genetics study, called the Gopher Kids Study, which enrolled up to 500 child subjects this year at the Minnesota State Fair. The study, advertised to families in a local newspaper with the slogan “DNA on a Stick!” offered a University souvenir, ride tickets, and admission to the 2011 and 2012 state fairs in exchange for yearly saliva, hair, nail, and blood samples. Taussig argued that the Gopher Kids Study is a citizenship project, not a scientific one. While its scientific questions are either nonexistent or facile, “it is teaching people how to be research subjects, and teaching them that they should feel an obligation to participate in a revolution in medicine.” As such, Taussig claimed, examining the Study provides an ethnographic opportunity to consider “the social transformations involved in efforts to realize a molecular medical clinic,” and reveals that attempts to close the gap between new molecular knowledge and as-yet-unrealized interventions occur in a space in which various relations are uncertain and contested. Historian/lawyer Jonathan Kahn’s talk, “The Expanding Embrace of Race in Biomedical Product Development,” drew upon Kahn’s extensive work on the use of race in the context of gene patenting and drug development to consider whether “BiDil is a harbinger or an anomaly.” Kahn detailed two recent pharmaceutical and medical device cases that illustrate “a powerful dynamic whereby increased biomedical knowledge, rather than leading to more individualized targeting of biomedical interventions, becomes reframed in terms of racial categories primarily for commercial benefit.” In the first case, Kahn raised concerns that race-specific clinical trials for the beta-blocker Bystolic® are expanding upon BiDil’s model, in which the drug is tested prospectively for efficacy in Blacks, and comparative efficacy between Blacks and Whites is not examined. Resonating with Tausig’s presentation, Kahn argued that with this trend, clinical trials are serving primarily a commercial rather than medical purpose. Collins, H. M., & Evans, R. (2002). The Third Wave of Science Studies. Social Studies of Science, 32(2), 235-296. Star, S. L., & Griesemer, J. R. (1989). Institutional Ecology, `Translations’ and Boundary Objects: Amateurs and Professionals in Berkeley’s Museum of Vertebrate Zoology, 1907-39. Social Studies of Science, 19(3), 387-420. Wynne, B. (1996). May the Sheep Safely Graze? A Reflexive View of the Expert-Lay Knowledge Divide. In Lash, Szerszynski, & Wynne (Eds. ), Risk, Environment and Modernity: Towards a New Ecology (pp. 44-83). London: SAGE Publications. Wynne, B. (2003). Seasick on the Third Wave? Subverting the Hegemony of Propositionalism: Response to Collins & Evans (2002). Social Studies of Science, 33(3), 401-417. Talia Weiner is a doctoral student in Comparative Human Development at the University of Chicago. She has conducted psychiatric anthropology/science studies research in the United States and Indonesia. Her interests include forms of biomedical subjectivity, narrative co-production, and the role of discursive practices in shaping experience. Weiner T. A report on the 2010 4S conference in Tokyo. Somatosphere. 2011. Available at: http://somatosphere.net/2011/report-on-2010-4s-conference-in-tokyo.html/. Accessed April 25, 2019. Weiner, Talia. 2011. A report on the 2010 4S conference in Tokyo. Somatosphere. http://somatosphere.net/2011/report-on-2010-4s-conference-in-tokyo.html/ (accessed April 25, 2019).